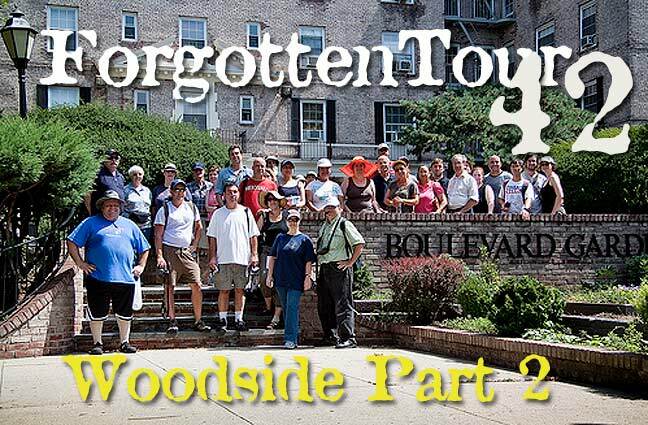 A few weeks after exploring the southern reaches of Woodside on ForgottenTour 40, the Newtown Historical Society and FNY turned north and dissected historical territory on Tour 42 (there was an intermission in Bushwick on Tour 41). 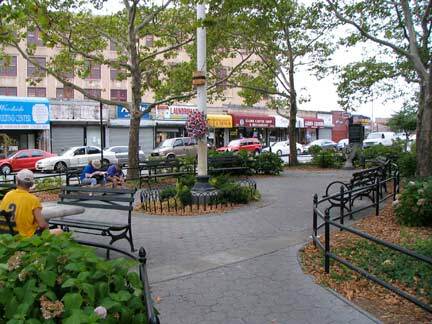 Woodside, a bustling community centered at Roosevelt Avenue and 61st Street, was originally a part of Newtown, a larger colonial village. It was largely a woodsy swamp until the mid-1860s, when developer Benjamin Hitchcock purchased the John Kelly farm and divided it into building lots located along today’s Woodside Avenue. 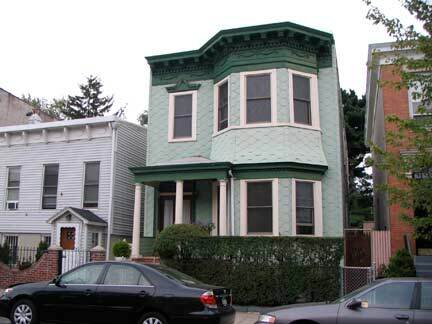 Kelly, an early settler, was part owner of a Brooklyn newspaper and sent it dispatches from his home in the ‘sticks’ that he called “Letters from Woodside.” Today in Woodside you are just as likely to exit an Irish bar and enter an Indian restaurant as you are to walk out of a bodega and pass a remnant of the colonial era. The tour met July 25th, 2010 (at 10:30AM to beat the heat in one of the hottest NYC summers in years) at the confluence of Northern Boulevard and Broadway, where subway and bus lines meet and the Amtrak line to Boston and New England arches overhead, though it doesn’t stop here. We began at two minor, albeit interesting, items at this junction. All five boroughs have a Broadway (the one on the Bronx is a northern extension of Manhattan’s) and while I have chronicled Queens’ Broadway extensively I’m not sure if I mentioned that it was actually was built from its extremities in Ravenswood, Long Island City and downtown Newtown (now Elmhurst) and was only completed, in the middle, after the IND Subway, which runs beneath it, was finished in the mid-1930s. Commuter and intercity rail connecting NYC and New England has run over these tracks since the Hell Gate Bridge was constructed in 1916-1917. Here the line has just emerged from the Sunnyside Yards and the tunnel to Penn Station. It will soon join with the NY Connecting Railroad at 25th Avenue and cross the bridge across Randalls Island and into the Bronx. The supporting columns here were clad with concrete when it was built — but the concrete is now crumbling off. The trestle is part of one of the most amazing transportation projects ever built: the tunneling of the Hudson River; the construction of the cavernous original Penn Station, bulldozed from 1963-1966; and the Hell Gate Bridge, completed in 1916, a relative golden age of railroading in NYC. 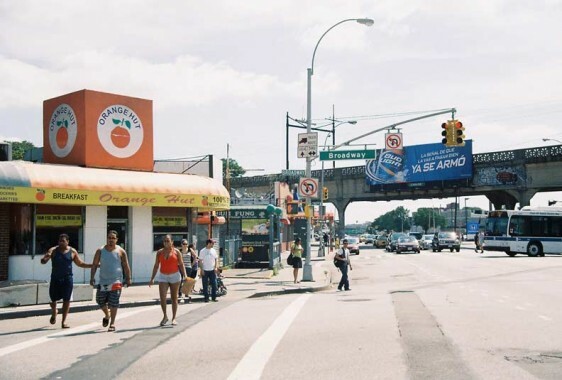 The Orange Hut at Broadway and 54th Street still carries the outlines and contours of its former life as a White Tower hamburger chain restaurant. 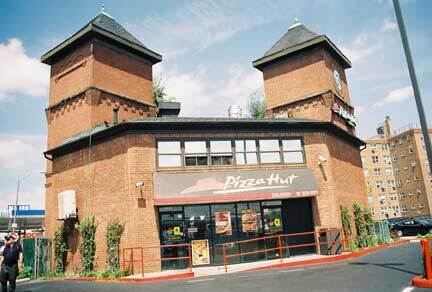 The last White Tower closed in Toledo, OH in June 2008; the chain originated in 1926. 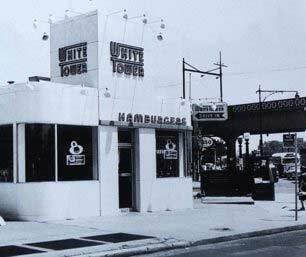 There were about 230 White Towers at the chain’s height in the 1950s. The restaurants have operated in at least 14 states, including New York, Illinois, Michigan, Connecticut, New Jersey, Virginia, North Carolina, and Florida. The interior of the Orange Hut still contains some hints of its origins, such as swivel stools adjoining a counter. 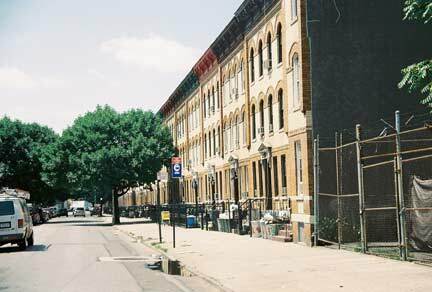 54th Street from Broadway to 32nd Avenue is lined on both sides with attached brick row houses, reminiscent of Sunnyside Gardens a few blocks to the west. Some of the original 1930s IND construction is evident in the vents that carry exhaust safely out of the tunnels. 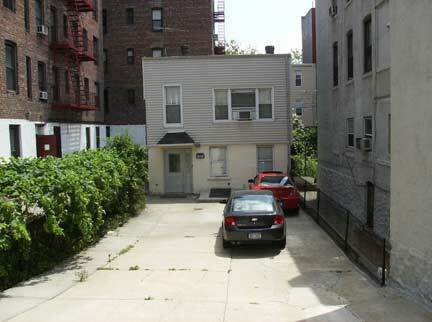 It looks like a fenced off empty lot on the west side of 54th Street between 32nd and 31st Avenues as you walk north. That’s until you see the tombstones. This has been a burial ground for what is now approaching three centuries. 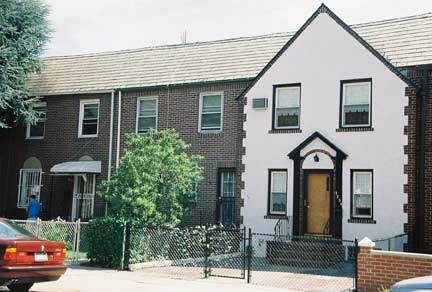 Queens was home to the Moore family, the family that gave rise to Clement Clarke Moore, to whom the famed poem The Night Before Christmas is credited. Clement was the great-great-great grandson of Reverend John Moore, who became the first minister in the town of Middleburg (today’s Elmhurst) in 1656. Family descendant Nathaniel Moore, Jr. stipulated in his 1827 will that his real estate on either side of Bowery Bay Road (today’s 51st street) be sold after his death, with the exception of the family burial ground, located today on the west side of 54th Street between 31st and 32nd Avenues. The cemetery was established by 1733 (the date of the earliest known burial) and has been known as the Moore-Jackson Cemetery since John Jackson married into the family and added to the cemetery’s acreage. He was, however, buried in the churchyard of St. James Episcopal Church on Broadway in Elmhurst. The last interment in the cemetery was in 1867. Moore-Jackson Cemetery’s condition has waxed and waned over the centuries. By the 1910s, Nathaniel Moore’s dictum that it not be sold was holding firm, but the burial ground had become a weed-filled dump. It was periodically cleaned up, but always again fell into decrepitude. 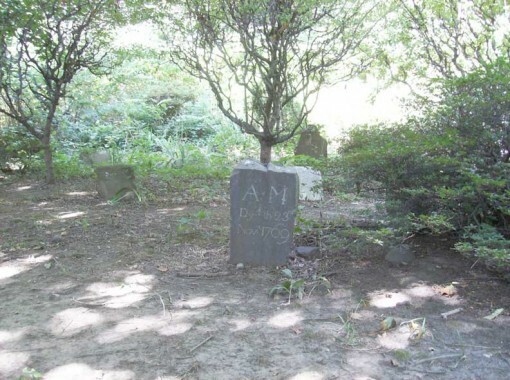 By the 1990s a more concerted effort was made and the cemetery’s condition has stabilized. Augustine Moore’s well-preserved 1769 stone is right in the front, reading “AxM, dyed the 23rd Nov. 1769.”. “x” was occasionally used to separate initials in this era. Records show that he was the son of Samuel Moore, Jr, and died at age 17. 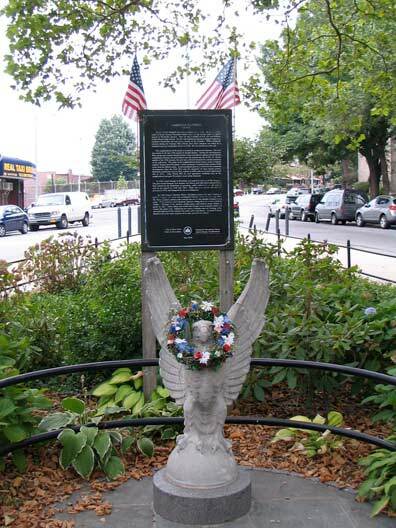 Boulevard Gardens, at the NE corner of 54th Street and 31st Avenue, was founded in 1935 as part of the United States’ New Deal initiative. T.H. Engelhardt designed Boulevard Gardens in 1933 in concert with renowned landscape architect C.N. Lowrie. Engelhardt and Lowrie brought the vision of the original developer, Cord Meyer Development Company to life. 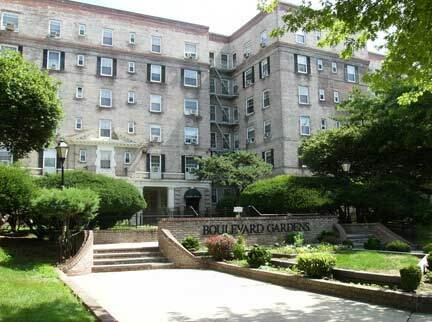 Currently, Boulevard Gardens is comprised of 963 residences with a mix of studios, one bedroom, two bedrooms and three bedrooms. Many of the high floor residences have Manhattan skyline views. 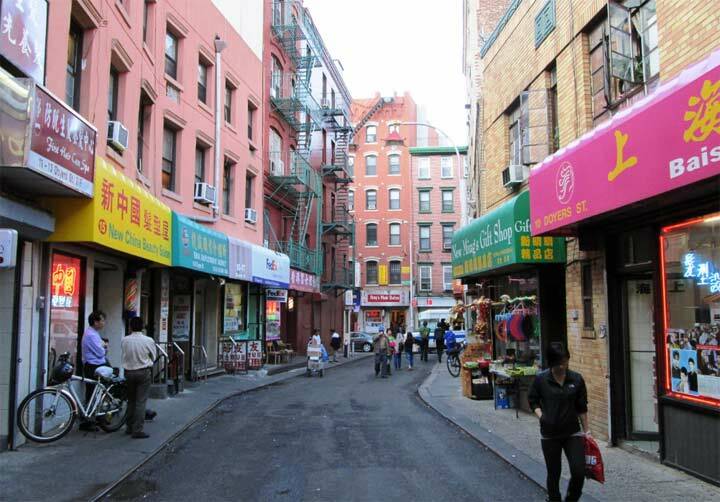 At 31st Avenue, 54th Street also intersects Hobart Street, a small piece of the colonial-era Bowery Bay Road, which once ran continuously from Calvary Cemetery north to Bowery Bay, an inlet in the East River just west of LaGuardia Airport. The triangle formed by the three is now Strippoli Triangle, named for Pfc. Joseph Patrick Strippoli (1946-1968) a local soldier killed by a land mine near the Cambodian border with Vietnam. 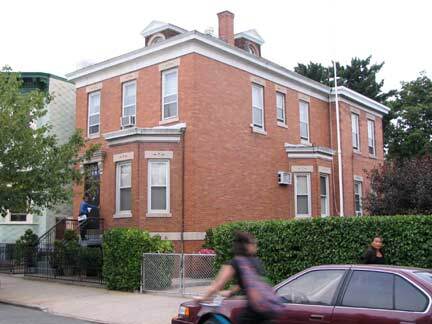 The Woodside Houses comprise 20 six-story buildings with 1,358 apartments housing an estimated 3,442 people. Completed December 30, 1949, the 22.3-acre complex is between 49th and 51st Streets, 31st Avenue and Newtown Road. The complex still has its original elegant blue and white tin directional signs. 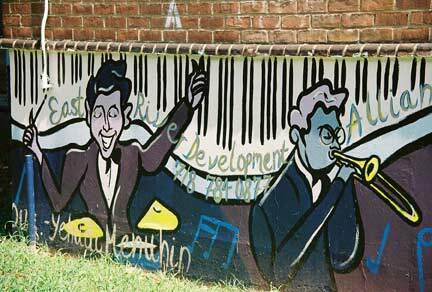 Artwork depicting jazz greats such as Billie Holiday, Frank Sinatra, Dizzy Gillespie and Glenn Miller is arrayed along the ground floor. 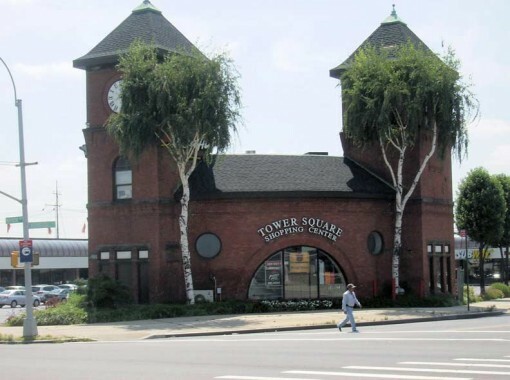 At Northern Boulevard and Woodside Avenue is a large shopping mall, delineated by an incongruous-looking twin-towered brick building. This was in fact the waiting room at an old trolley junction for four decades, and the subject of thevery first Forgotten New York page I wrote in 1998. 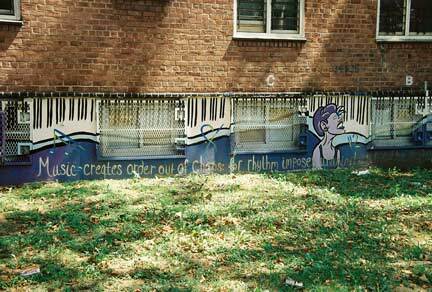 William Steinway, the piano manufacturer, electrified his Long Island City streetcar line, the Steinway Railway Company, and hooked up with developer Cord Meyer’s Newtown Railway Company, which extended to Corona, in 1894. Two years later, the lines reorganized as The New York and Queens County Railway Company and built a handsome, twin-spired brick depot at Northern Boulevard and Woodside Avenues. Trolleys would ply these roads to Queens’ eastern sections. Steinway, for his part, actually built a tunnel to take trolleys into midtown Manhattan on 42nd Street, but they went unused for two decades before they were reactivated as part of the IRT Flushing Line when it opened in the early 1910s. “New York and Queens Co. Ry. 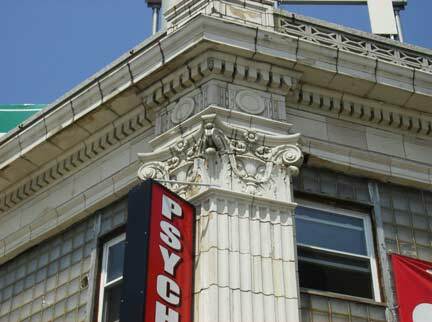 Co.” can still be seen chiseled into the side of this building adjacent to the old trolley barn, now tenanted by a laundromat. 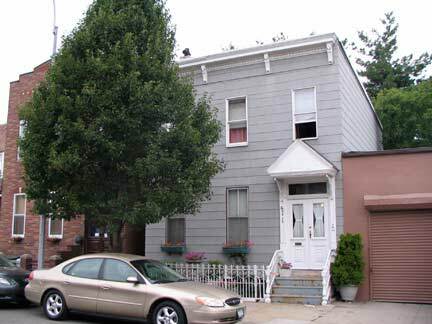 Woodside Avenue, formerly Hell Gate Road, was the only road that went to central Queens from here in the colonial era as it traversed a swamp. Hessians were garrisoned here during the Revolutionary War. As late as 1900 they were still finding British hut foundations here. The slight elevation in Northern Blvd at Newtown Road and Woodside Avenue is due to an old beaver dam in this former swampy area. 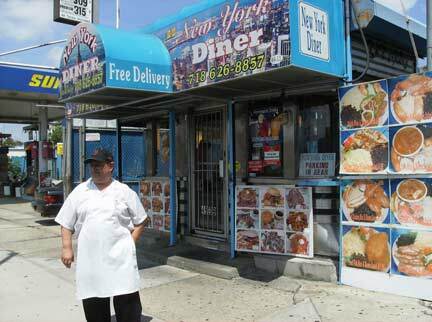 Owner Mario stands outside the New York Diner. The diner, known previously as the Blue Crystal and Ham & Eggery, was built in 1949 by the Mountain View company of Singac, NJ, which was in existence between 1939 and 1957. Several Mountain Views are scattered around in NYC and across the country. Kevin James and company filmed an episode of The King of Queens here on Sept. 29, 2001. 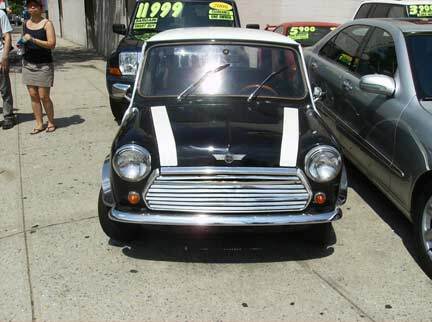 We found a vintage BMC Mini at a used car lot. 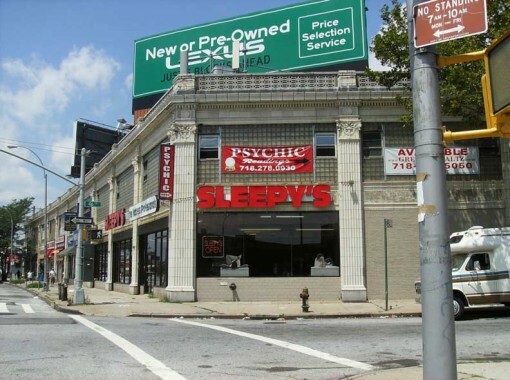 Northern Boulevard, from Queens Plaza to Woodside Avenue, is the used car capital of Queens and has been home to auto repair shops, car dealers, car parts manufacturers for decades. 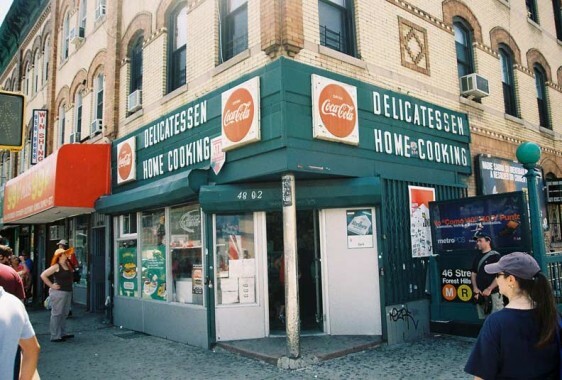 Your webmaster worked in the now-defunct Standard Auto Parts shop (they had their own printed materials production department) on Northern and 36th Street for a few months in 1999. Walking north to Broadway and 48th Street, we noted the classic pair of tin awning signs on the corner. If a sign style was ever emblematic of NYC’s grocery stores, newsstands and delicatessens from say the 1940s through the 1970s, the tin background with block lettering, seen here, is it. This scheme appeared on countless such signs around town but yet, I’m still amazed when one pops up someplace. The tin letters on green background were offered to shopkeepers by local Coca-Cola bottling companies. The letters were attached the green portion of the sign to spell out whatever the vendor wanted and are referred to as the “privilege panel”. Mathews flats were financed by letters of credit exporting wine to Switzerland. Gustav Matthews got money out of Germany and brought it to America to finance these houses. The grape leaves motif in the building lobbies are a tribute to the practice. 48th Street here is lined on both sides with uninterrupted vistas of Mathews Flats, giving a tight, uniform streetscape.This stretch was featured in the 1981 Milos Forman film adaptation of E.L. Doctorow’s Ragtime, the only film featuring both Jimmy Cagney and Queens’ Fran Drescher. By 1917, Mathews flats were in such demand that it’s said that if laid side by side the entire string of houses would reach 4.5 miles. All feature a distinctive Romanesque Revival arch window on the third floor, with the 2nd floor windows getting a less severe arch. Each house has 6 apartments with two units per floor. Bob Singleton, President of the Greater Astoria Historical Society, joined us here. 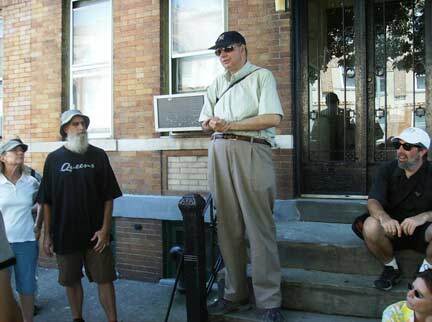 Bob, an engaging raconteur, regaled the crowd with historic information for the remainder of the tour. We then took note of a couple of Northern Boulevard ghosts at 48th Street: the former Ronzoni factory, which survived till the early 1990s, now replaced by a Home Depot; and the Madison Square Garden Bowl. 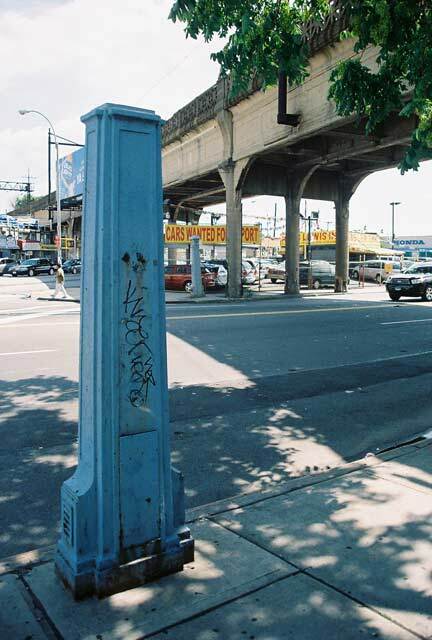 Northern Blvd. and 48th Street, now home to a stretch of car dealerships, was once the site of a massive, 72,000-seat open-air stadium, Madison Square Garden Bowl. It was open for only a few years in the 1930s, during which time the heavyweight boxing champion lost each time; the last winner was Joe Louis, who would have likely broken the curse had the place remained open. Madison Square Garden management decided to lease bouts to Yankee Stadium or the Polo Grounds in the late 1930s and the Bowl was unceremoniously razed. One such car dealership is the should-be-landmarked Packard showroom on the north side of Northern Boulevard between 45th and 46th, now home to many different concerns. Old photographs show there used to be plate glass windows where the glass bricks are now, with autos displayed behind them. Packard was an American luxury automobile marque built by the Packard Motor Car Company of Detroit, Michigan, and later by the Studebaker-Packard Corporation of South Bend, Indiana. The first Packard automobiles were produced in 1899 and the last in 1958. Packard was founded by James Ward Packard (Lehigh University Class of 1884), his brother William Doud Packard and their partner, George Lewis Weiss, in the city of Warren, Ohio. 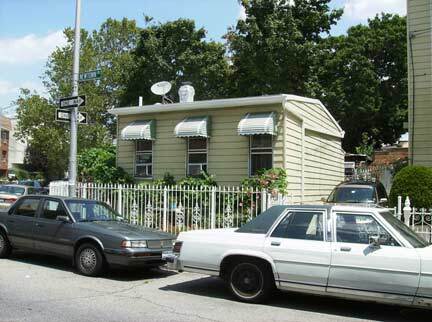 Some of the unusual houses of 45th Street. Many date to the early days of Long Island City from the 1870s on and were built when these streets had names, not numbers. A few are considerably set back from the street. 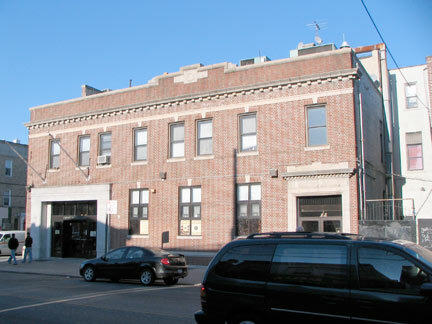 On June 8, 1875eight individuals met and organized the Long Island City Turn Verein at Koch’s Hall, N.E. Corner of Broadway and 9th Avenue [today’s 38th St] in Long Island City, N.Y. for the sole purpose of introducing and furthering German Turnerism (which embraces the philosophy of building a “Sound Mind in a Sound Body” fostered by Friedrich Ludwig Jahn in Germany). 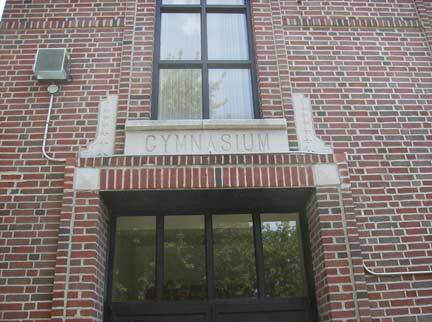 The society’s purpose was to educate its membership physically and mentally through gymnastic exercises and by encouraging use of the German language.The present building was constructed in 1928 and sold in the mid-1970s. The society is now based in Nassau County. 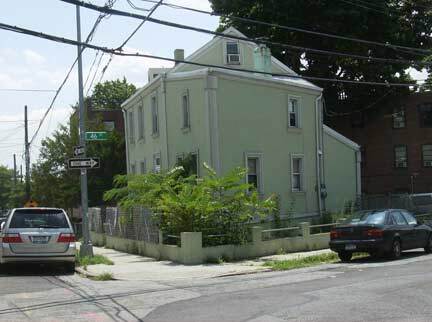 The stretch of Newtown Road from Northern Boulevard to 30th Avenue is an old piece of the road to Hell Gate and is suffused with colonial history. Like a number of streets and roads in NYC, Newtown Road isn’t named for the neighborhood where it is, but for the neighborhood it runs to. And, like a number of NYC streets that run aslant the overall grid, it’s one of the older roads in the area. It is an Indian trail that became the main road to early Astoria settler William Hallett’s farm in the mid-17th Century, and to the treacherous Hell Gate, the east River crossing to Manhattan. Its eastern stretch that ended in the heart of Newtown, now Elmhurst, was called Hurlgate, or Hellgate, Ferry Road; later named for the town through which it passed, becoming Woodside Avenue.This is the last remnant of an old village called Middletown (likely called because it lay between old Astoria and Newtown) instituted in the 17th Century. 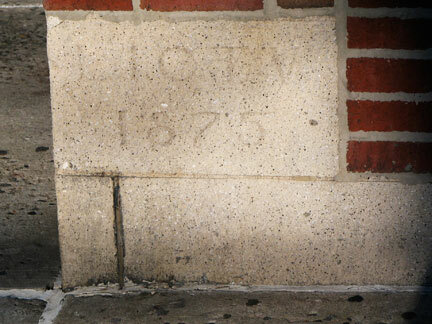 In 1721 one of Queens’ first schools was located here at the confluence of Newtown and Old Ridge Roads. British and Hessian troops marched by the school during the American Revolution. A century later, some schoolboys found a cache of gold coins worth $840 in its walls, likely hidden during the Revolution.